I've been checking Hilton's website on a regular basis this week (I travel on a weekly basis). For the entirety of this week, it's been giving me an SSL error - Safari can't verify the identity of the website "www3.hilton.com". It looks like the certificate is for a248.e.akamai.net. Now there is no reason not to trust Akamai, but having the wrong certificate for a domain is always a problem. Update (16-June-2015): It took Hilton 10 days to respond to my email informing them of this issue. The SSL problem persisted for days later and now it looks like they've disabled redirection from http to https sites. When accessing the https site manually, the SSL certificate is still wrong. Two weeks later, it's not fixed properly. 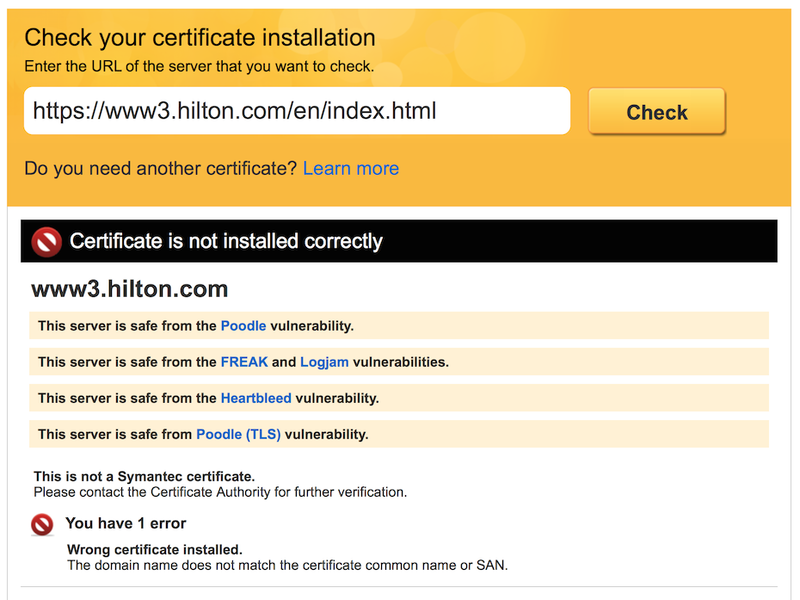 I guess someone installed the wrong certificate when updating Hilton's servers. Ooops, right?! The Symantec SSL Toolbox confirms this. So for now I will be staying away from Hilton's site for any reservations, at least until they fix their certificate issue.